Fish are healthful foods that provide a diet high in protein and low in saturated fat. Studies have shown that omega-3 fatty acids in fish may reduce the risk of heart disease and stroke. Fish also provide a good source of vitamins and minerals. Fishing is a fun and relaxing outdoor activity that you can enjoy with your family and friends. Whether you are fishing to enjoy the outdoors, to spend time with family, or to catch dinner, you should always be safe. However, some fish may not be safe to eat because they accumulate environmental contaminants from the water in which they live or from the food they eat. These environmental contaminants may accumulate to levels that may be harmful. This does not mean that you have to stop eating fish. The benefits and risks of eating fish should be balanced, since fish are an excellent source of high-quality protein and omega-3 fatty acids, and are low in saturated fat. 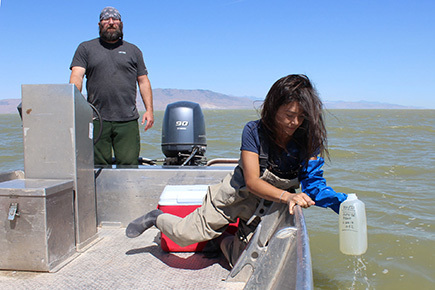 In order to protect Utahn’s from unknowingly eating contaminated fish, The Utah Department of Health, the Division of Wildlife Resources, and the Utah Department of Environmental Quality work together to test fish and issue fish consumption advisories which recommend limits for consumption of fish caught in specific waterbodies in Utah. View an interactive map of Utah’s fish advisories. You should also be aware that the fish you buy can contain contaminants. The Food and Drug Administration (FDA) and the Environmental Protection Agency (EPA) advise that nearly all fish and shellfish contain traces of mercury. For most people, the risk from mercury by eating fish and shellfish is not a health concern. Yet, some fish and shellfish contain higher levels of mercury that may harm an unborn baby or young child’s developing nervous system. The risks from mercury in fish and shellfish depend on the amount of fish and shellfish eaten and the levels of mercury in the fish and shellfish. Therefore, the Food and Drug Administration (FDA) and the Environmental Protection Agency (EPA) are advising women who may become pregnant, pregnant women, nursing mothers, and young children to avoid some types of fish and eat fish and shellfish that are lower in mercury.